As the Somali government bans foreign aid workers from militant-controlled areas for their safety, the situation deteriorates for the famine-stricken explains Oxfam’s PRO in Somalia. Abdinur Isse stands in the ruins of his house in Mogadishu, Somalia which was razed by shells during fighting in Bondhere district, Somalia. EARLIER THIS WEEK, the Somali government banned foreigners from delivering aid to areas controlled by militants. The mayor of Moghadishu Mohamud Ahmed Nur said that they were concerned for the safety of aid workers after two Turkish workers were briefly taken hostage by an Islamist group by just such a group last week. However, the UN is warning that 750,000 people will die in the next four months in Somalia. Goal CEO John O’Shea said the international community had to enforce safe passage for aid workers to save as many people as possible. It’s hard to blend in during a community visit when you’re wearing a heavy flak jacket. But here I was in Mogadishu, the conflict-ravaged capital of Somalia, dressed not in the hijab I’d just bought in Kenya, thinking it was culturally appropriate, but strapped into a bullet proof protective vest, weighing 10 kilos or more, slowing down my movements as I ran about trying to film the work Oxfam is supporting and marking me out clearly as a foreigner. I was part of the first Oxfam visit to Somalia by non-African staff in years. The country has been mired in civil conflict for the past twenty years; but now severe drought has pushed millions into desperation. The UN has declared six areas of the country famine-affected; more than a quarter of the population had been displaced by the crisis and conflict, with several hundred thousand fleeing into neighbouring countries such as Kenya and Ethiopia. And inside the country, many more are displaced. Hundreds of thousands have taken shelter in makeshift settlements and camps around the capital, Mogadishu. I visited some of those camps with two Oxfam partners, Hijra, which specialises in providing water, sanitation and hygiene, and SAACID (a Somali word meaning “to help”), whose therapeutic care centres for malnourished children and mothers are supported by Oxfam. But we were under strict security rules and told not to linger in one place for too long. But Somalia is not like most other countries. While the security situation has improved in central Mogadishu, no-one takes things for granted. People still worry about getting shot or abducted; cars being targeted and explosive devices going off. Gunshots often ring out – sometimes fired into the air by government forces or peacekeepers simply to clear traffic jams because there are no working traffic lights in the city. Outside the capital, the security situation is even tougher. Fighting continues among the country’s rival groups; and thousands of people find themselves trapped between different forces, unable to freely move and access basic food and health services. Those who have made it to Mogadishu, often after long journeys by foot, as they flee conflict and famine, end up in the overcrowded makeshift camps dotted around the city. They live in densely packed areas in huts that are made out of plastic sheets or rag cloths supported by twigs. It was in these crammed camps that we spent some of our time seeing how Oxfam-supported projects are providing help to those desperately in need. Clean drinking water and sanitation is a priority, especially as the rainy season is approaching and there have already been deadly outbreaks of diarrhoea and cholera. One of our partners, Hijra, has been installing water tanks and tapstands and chlorinating water. They’ve built latrines and helped and trained communities to form volunteer water, environment and sanitation committees to make sure the water sources aren’t contaminated. One group of people were energetically sweeping up garbage as we arrived to look at how the community got their water. In Siliga camp for thousands of the displaced, I met mother of seven, Habiba Osman. “There is no problem with water now; we have plenty of water all day long” she said. But we had lingered long enough and it was time to get back into our vehicle to our next location. My glimpses of the city, behind the tinted windows of our car speeding as fast as it could to avoid being a sitting target, were tantalisingly brief. The legacy of war was obvious; there were many wrecked or bullet-marked buildings. But the city also showed surprising signs of brisk daily life. There were colourful hand-painted shop signs advertising their wares, while some traders sat on the dusty roadside, touting their wares, normally small collections of fruit and vegetables. Some sat behind sandbags, which might offer some protection if fighting flared up. Signs of commerce and of food availability were evident: but for many who fled from hunger and drought, the prices were way above what they could afford. That’s why the centres that offered some basic help were packed. At one community based therapeutic care centre I visited run by SAACID, staff were working flat-out as mothers and their children continued to stream in. In one area, health promoters were explaining good healthcare practices to young mothers and why it was important to breastfeed; in another, children were being vaccinated against measles; and in yet another section, the frailest of children were being assessed and weighed. Almost all were malnourished; some, dangerously so. Mothers coming here will receive therapeutic food to help their child’s recovery. 35 year-old Hawee Mohammed had brought in her seven month-old son, Ibrahim. He weighed just 4.7 kilos – almost half the normal weight for a child of his age. The family moved to Mogadishu from Bay region, an area declared famine-hit by the UN after their animals died and the children got sick. Hawee told me Ibrahim’s twin brother died of diarrhoea and she was desperate to get help for Ibrahim, who had a high fever. As in most crises, it is the youngest who are the most vulnerable. Hundreds of thousands are dangerously malnourished in a country which has the world’s highest mortality rate for children under the age of five. They desperately need help. The famine in Somalia shows no sign of easing and tens of thousands of people have died. The UN says 750,000 people are at risk of starvation. As I saw on my visit, aid is getting into Somalia. But the problem is that its still nowhere on the scale that’s needed. 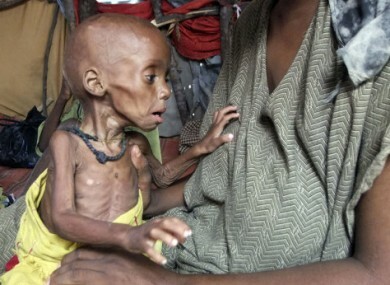 Email “Inside Somalia: How violence is trapping the starving”. Feedback on “Inside Somalia: How violence is trapping the starving”.